Tall delivery vans like this aren’t quite as ubiquitous over here in the U.S. market as they are in Europe. While we do get the full-sized Transit and Sprinter, the Volkswagen Crafter is not on our shores. 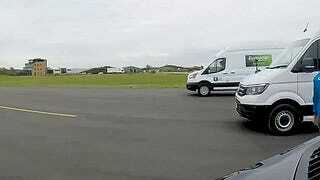 If you’ve ever wondered which of the three big vans is quickest, this video from CarWow has the answer. There are enough of these floating around U.K. streets that the folks over there have well established stereotypes of what makes up the idea of the white van man. And they’re all covered in this video, from the pro-leave newspaper to the petrol station-sourced lunch. It’s a lighthearted quick video that manages to entertain and provide valuable information. Which long-wheelbase high-roof four-cylinder turbo diesel delivery van is best for your needs?